Ever since the weather turned cold, I have been craving soup! Anyone else feel the same? I absolutely love going to Panera for their baked potato or creamy tomato soups. Paired up with their delicious bread, the soup really makes for a tasty meal on chilly fall or winter days. I found an easy and economical recipe in the November issue of All You magazine that my family liked, and then I tweaked it a little bit to use what we had on hand. This potato soup has just a few common ingredients: potatoes, butter, flour, milk, cheddar cheese, sour cream or half and half, cooked bacon, and green onions. To begin, you’ll want to put your potatoes in the microwave and cook them until they are soft. I used Yukon Gold potatoes here, but russet potatoes would also work well. While the potatoes are cooking, start the soup base by melting the butter in a large soup pot over medium heat. 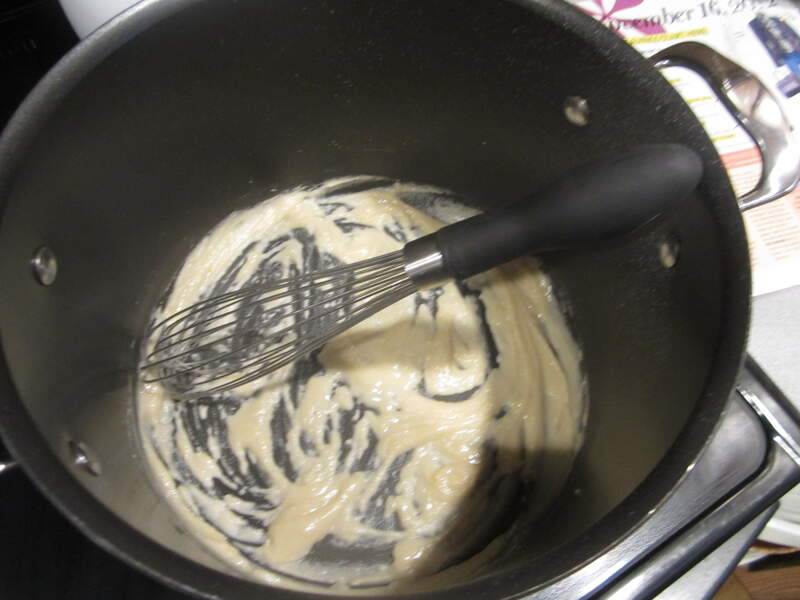 When the butter is totally melted, sprinkle the flour over top and whisk to combine. Let this mixture bubble together for 1-2 minutes to make sure the raw flour taste cooks out before you add the milk. When the butter/flour mixture has cooked, pour in the milk all at once, and whisk well to avoid any flour-y lumps in the soup. You’ll want to let this soup base come up to a bubble, and then let it cook for about 5 minutes or so to thicken. Don’t worry if it seems a bit watery at this point…once you add the potatoes, they will thicken the soup even more. When the potatoes are done, you’ll want to mash them with a fork or potato masher. Because the skin is pretty thin on a Yukon Gold potato, I chose to keep the skin on my potatoes and put it in the soup. If your family doesn’t care for potato skin, by all means, leave it out. Add the mashed potatoes to the soup along with the cheese and some salt and pepper to taste. 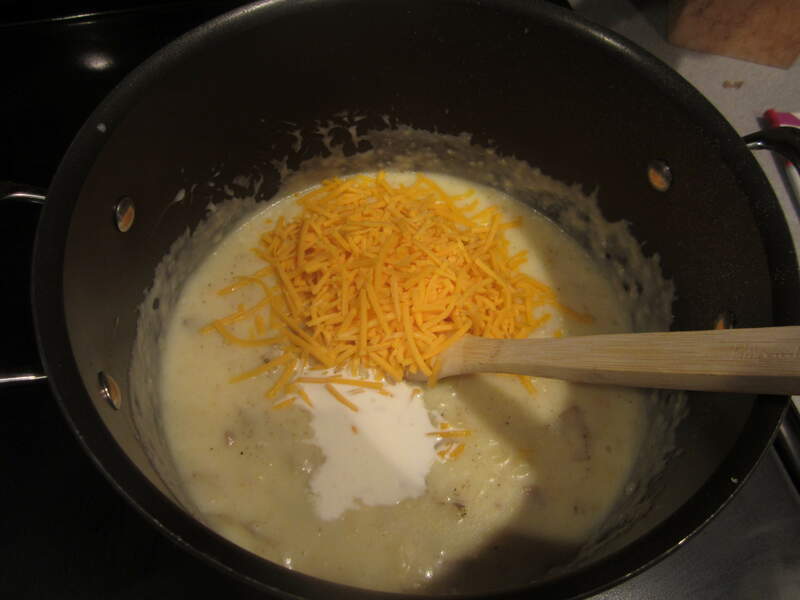 When the cheese is melted, add the bacon, green onion, and sour cream (or half and half) to the soup and stir to incorporate. 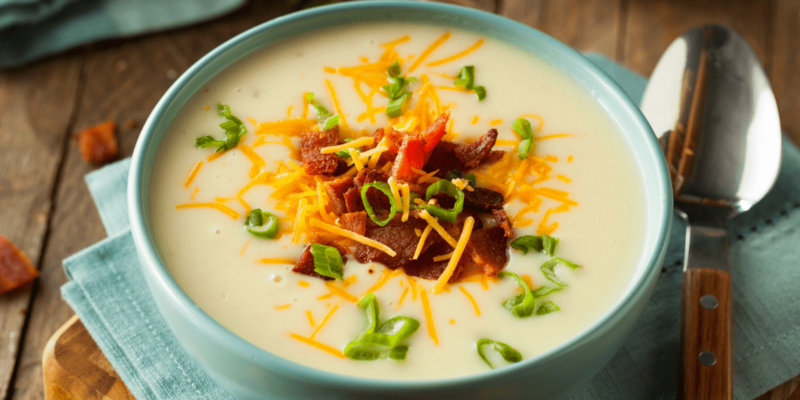 Ladle the soup into bowls and top with additional cheese, bacon and green onion…yum! 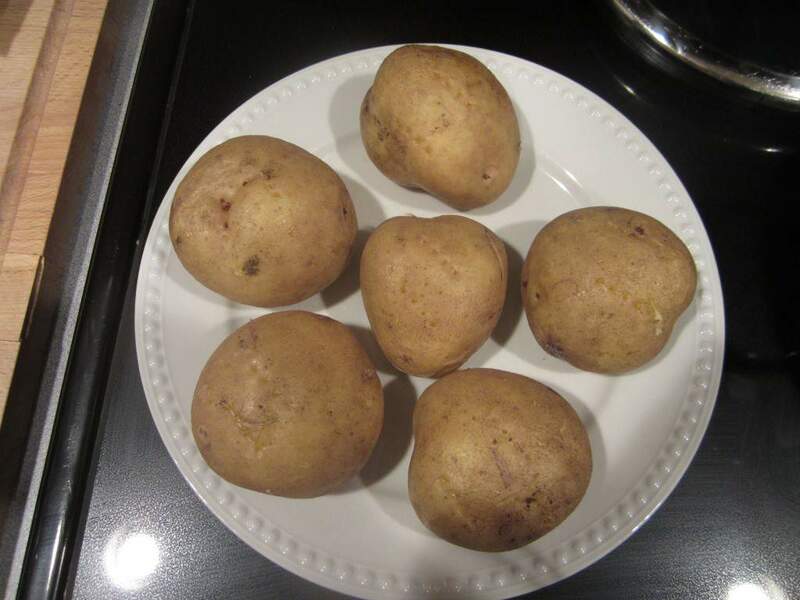 Place your potatoes in the microwave for approximately 15 minutes, or until tender. Let them cool a bit, then peel and mash with a fork. If you are using a potato with a thin skin, you can leave the peels on. Meanwhile, melt the butter in a large saucepan. 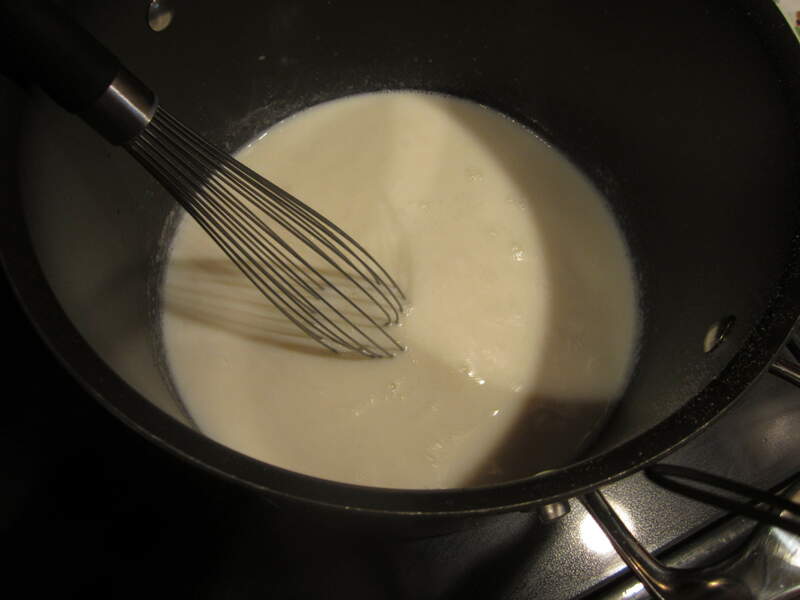 Add the flour and cook for 1-2 minutes, then pour in the milk while whisking. Let the sauce cook until thickened, about 5 minutes or so. When the sauce has thickened, add the mashed potatoes and cheese, as well as the salt and pepper. The potatoes will thicken up the soup quite a bit, so don't be afraid if it seems too watery at first. 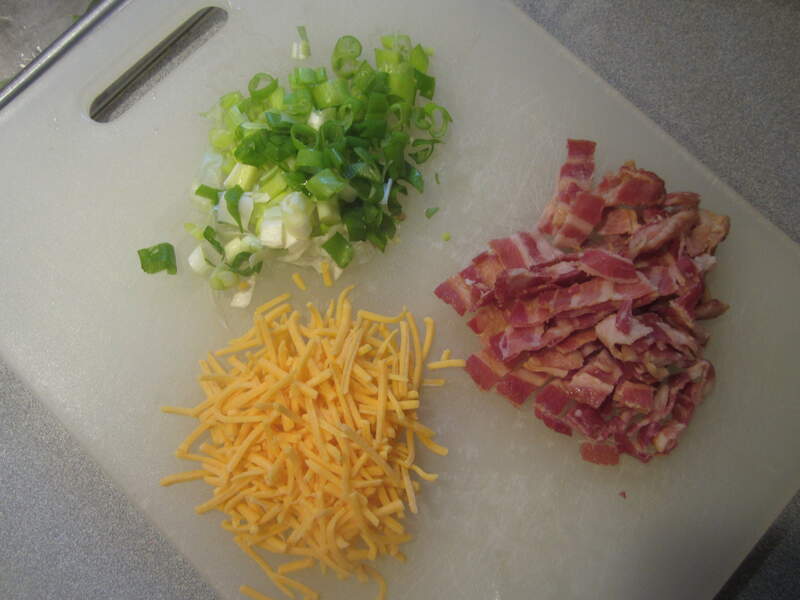 After the cheese has melted, add the bacon and green onions, along with the sour cream or half and half, stirring to incorporate. Ladle the soup into bowls and top with extra cheese, bacon, onion, sour cream, or all of the above! 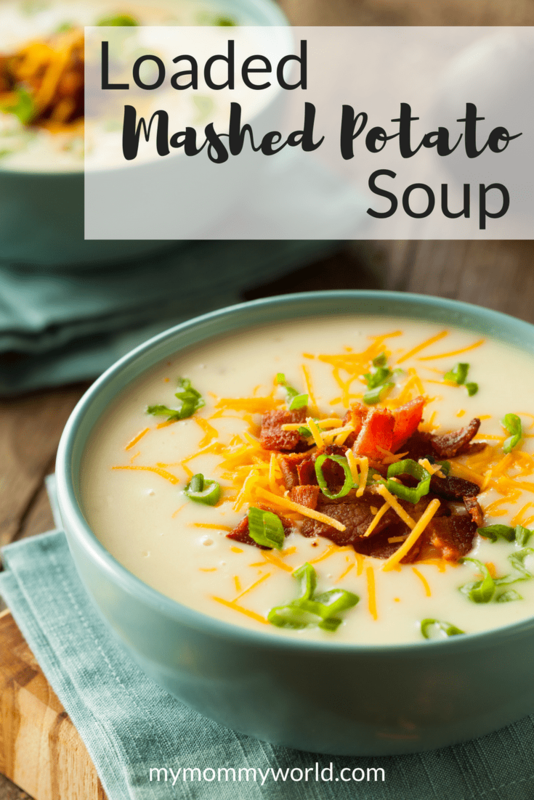 Hope you all enjoy making this easy and tasty loaded mashed potato soup! For more simple dinner ideas, check out Easy Dinner Recipes for Families.